Medical Director of Radiation Oncology and Top Doctor of 2012. Dr. Albert Mak is the Medical Director of Radiation Oncology for the Pasadena CberKnife Center. A Board-Certified Radiation Oncologist, Dr. Mak earned his M.S. degree in Electrical Engineering from U.C. Berkeley in 1985 and his M.D. degree from Chicago Medical School in 1989. Dr. Mak completed his residency training at the MD Anderson Cancer Center in Houston, Texas from 1990-1994. Dr. Mak has served as the Medical Director for the Departments of Radiation Oncology at Glendale Adventist Medical Center and White Memorial Medical Center since 1995. Having extensive experience in IMRT and brachytherapy, he also performs permanent seed implantation for prostate cancer patients at the outpatient surgery center in the facility. 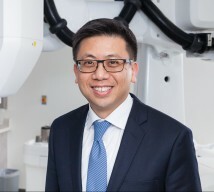 Dr. Mak is the Co-Director for the Stereotactic Radiosurgery at Glendale Adventist Medical Center, one of the very few radiosurgery programs in Los Angeles. When Dr. Mak is not delivering radiation, he enjoys traveling and spending time with his family and friends.